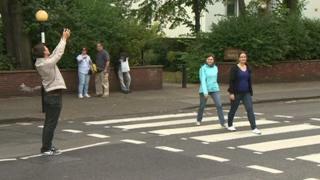 The use of a lollipop lady is being considered at London's Abbey Road crossing as tourists flock to create the scene made famous by the Beatles. Westminster City Council has raised safety fears over the thousands of people who visit the zebra crossing, in St John's Wood, north London. Residents have also complained about the increase in traffic at the height of the summer season. The council said no proposals had been agreed and the review was ongoing. Councillors have also raised concerns about buses carrying tourists causing traffic congestion by double-parking or parking on yellow lines. A Westminster City Council spokeswoman said it is discussing options to manage the busy traffic flow, including the possibility of employing a lollipop lady or man. She added: "Local Abbey Road ward councillors raised their residents' concerns about the number of tourists spilling into the road and traffic near the crossing at the height of the summer season, and put forward various suggestions, asking the city council to review pedestrian safety and crowd management. "However, no proposals have been agreed by the council, nor the review completed." The Zebra crossing is Grade II listed and was made famous after John, Paul, George and Ringo traversed it for Ian Macmillan's iconic cover shot for the 1969 Abbey Road record.